The “Mother Seed”, known today as quinoa, has been a sacred healing plant grown in the Andean mountains for millennia. Inspired by ancient crafting traditions, our snacks honour the indigenous farmer and everyone who handles the seed. Using an old Egyptian panning technique, the organic quinoa snacks are then coated with premium dark chocolate, resulting in the perfect bite! 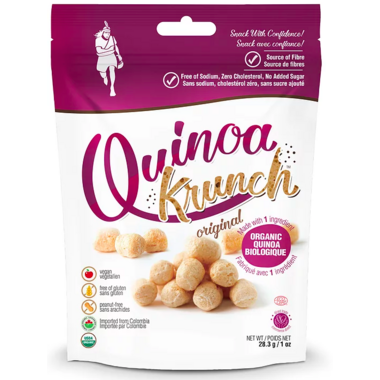 The nucleus of the snack is 100% organic quinoa with no fillers, no flour, or other ingredients. Ingredients: Organic quinoa (Chenopodium Quinoa Wild) Packaged in a facility that also processes tree nuts. Nice light snack, or I often have them with yogurt for breakfast!